The software development field is notoriously crowded. With so many different companies offering a slew of products and services, it can be nearly impossible to differentiate the good companies from the bad ones from the great companies. The ratings and review site, Clutch, helps solve this problem by integrating objective quantitative data, customer testimonials, and case studies together to rank companies and gain market insights. Based in Washington, D.C., Clutch provides businesses and customers with reliable information about the quality and content of a wide range of businesses, so that people can know before they buy. 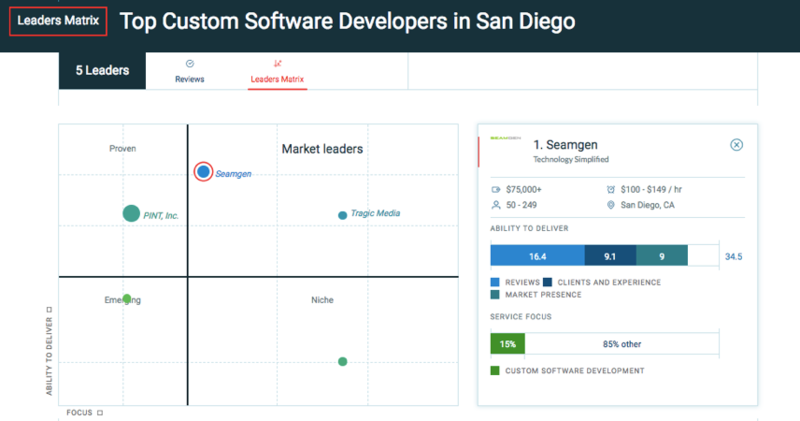 A testament to our team and especially our clients, Clutch not long ago recognized Seamgen for having the top software developers in San Diego! Clutch complements their rankings with in-depth client reviews to get a clear picture of various businesses. Our terrific clients were thrilled with the work we accomplished together — and they made sure Clutch knew it. Several clients communicated with Clutch, underscoring various aspects of Seamgen, such as our company culture that puts the client’s work above all else, and our combination of UI and UX abilities. When a client partners with us we get to know their business and their customers, and intimately craft custom software solutions that provide cutting edge experiences and produce value for your customers and your business. If you would like to learn more about Seamgen or are interested in working with us for your next software development project, please contact us.